Take control of your online reputation and presence. Not knowing about your business will be impossible! Whether you would like to give your brand’s image a good visibility online, position yourself amongst the competition in your market, introduce your product line to the public, make your business known to your target audience or promote your business locally, this package will come as a real solution to effectively raise the awareness about your business. 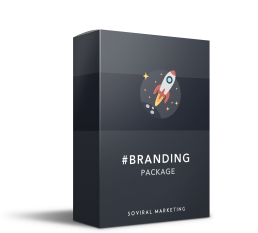 With the #Branding Package, you will position your business’s brand by making it seen. Branding is about repetition and omnipresence. Your business will now have both a digital identity and presence on two social networks of your choice, with engaging and informative profiles and a visibility through advertising campaigns existing at each point of visit on the Internet (on Facebook and on Google’s advertising network (all news, blogs and other specialized websites). It will be impossible to not know about your business, your brand, your product or service! 2 hours of personalized support to further help you with the strategic development of your branding and business awareness.